You are right to be worried. 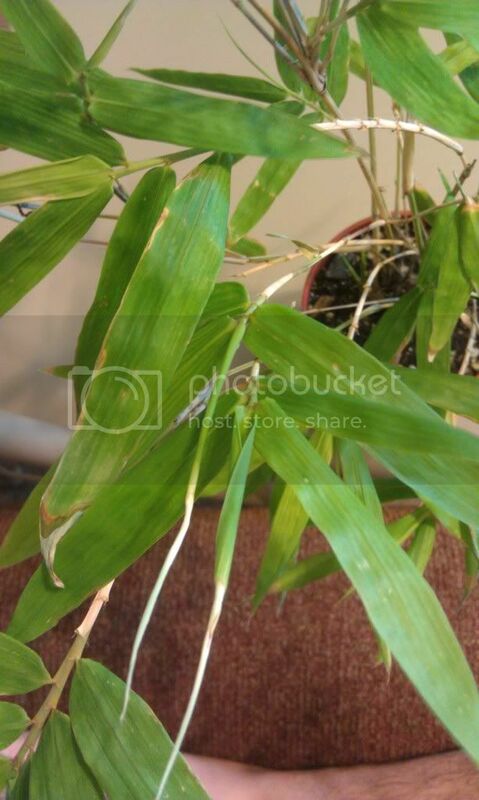 Leaves in the bottom picture are not yellowing, they are browning and dying. 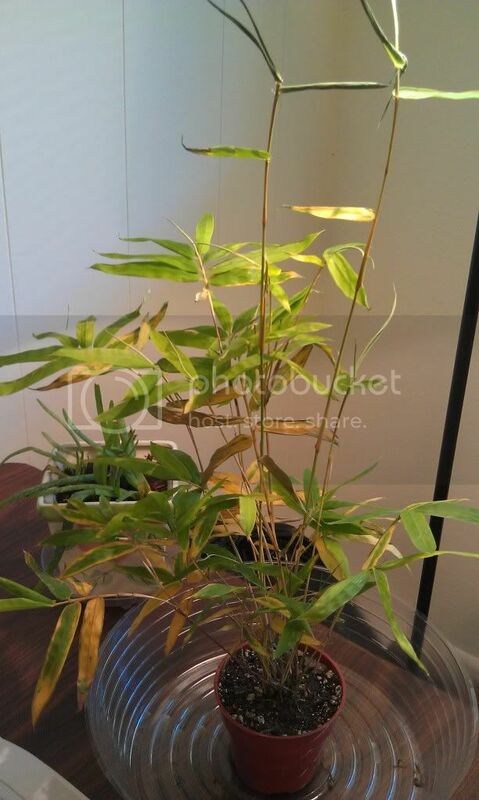 I don't know much about bamboo and especially about bamboo as a house plant. You mentioned watering it when you got it. Have you watered it since? 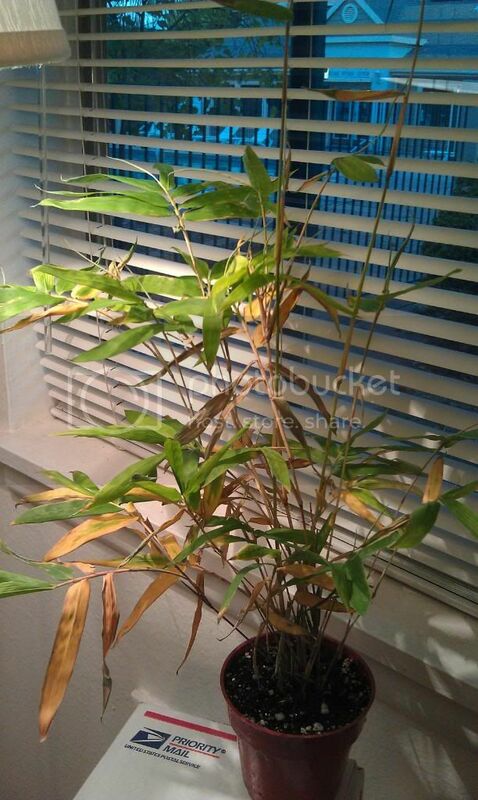 Like most house plants it wants to dry out between waterings. I see the lamp near it, but is it near a window? I think they like pretty much light, I'm not sure just your lamp is enough. Hopefully, someone will come along that can help more. In the meantime, don't fertilize. People often think it will help a struggling plant to give it fertilizer; it doesn't, it just stresses it more. 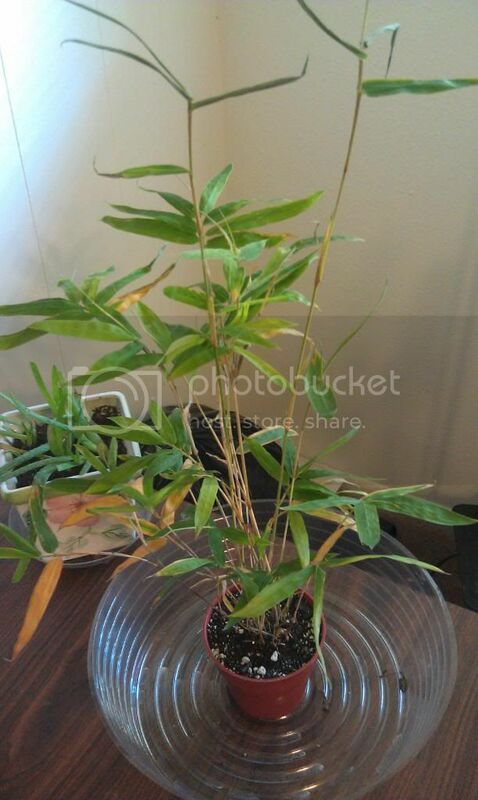 I don't know much about bamboo, either, but the pot looks too small for a plant that size. I recommend that you gently slip the root ball out of the pot and, if the roots are winding around it, move the plant to the next-size larger pot. The pot looks like it's plastic, so just squeeze it all around to loosen the root ball, then tap the edge of the pot on your other hand. The root ball should slide right out into your hand. @rainbowgardener Thanks for the quick reply! Yes I have watered it 3 times since I got it, first when I opened the box, next 24 hours later (which may have been too soon) and the next time was 48 hours after that so the soil could completely dry (that was this morning) I also started to use bottled water to water it because the water here isn't the best (but again I'm not sure if that will affect it.) 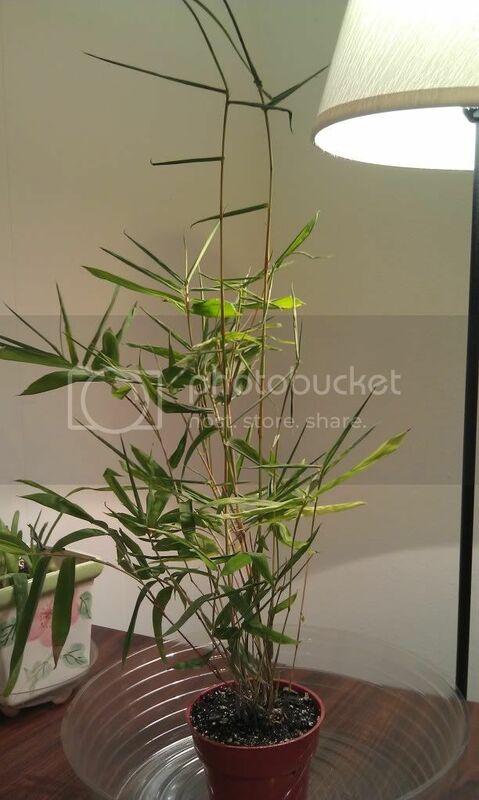 As for the window, there is a North facing window (the only facing I have :/ ) about 4ft or 5ft away, with the lamp acting as supplementary light, I will move the plant directly under the window today for the first time and hope that helps. @Kisal Again thanks for the reply! 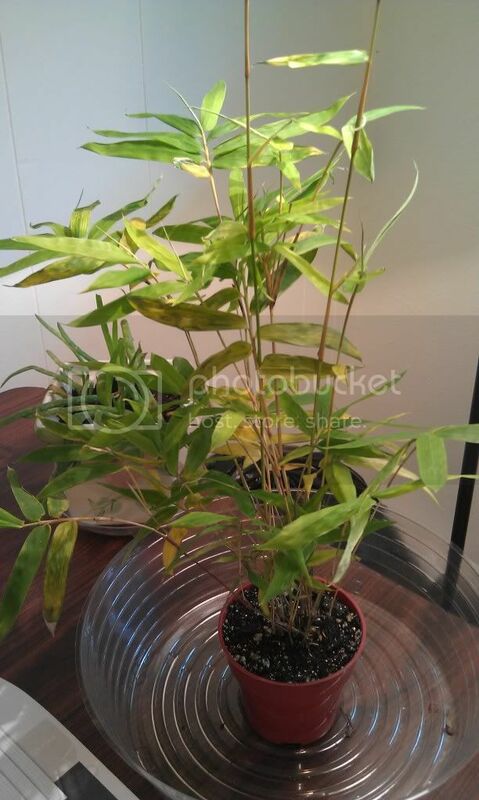 Seeing as how I just got this plant in the mail, I'm worried that if I repot it, it may die due to the the shock (does this shock the plant a lot, or is it relatively harm-free? ), however if nothing else starts working in the next few days I might give this a shot. I'll post a picture later today after it gets a full day of "window exposure" and hopefully it will have slightly improved. Ok, so I gave it a full day of light today, by placing it directly next to the window, instead of 5 feet away, and it generally seemed to like this, there was very little new yellow today, or maybe there was so much from before that I did not notice it. Anyhow I decided to remove all the dead leaves that would come off at the slightest touch (I pretty sure they will not magically spring back from the dead) While doing this I noticed some of the dead leaves had really thin green "things" growing from the base of them, which almost seem like replacement leaves (fingers crossed). Does anyone know for sure if this is what they look like? 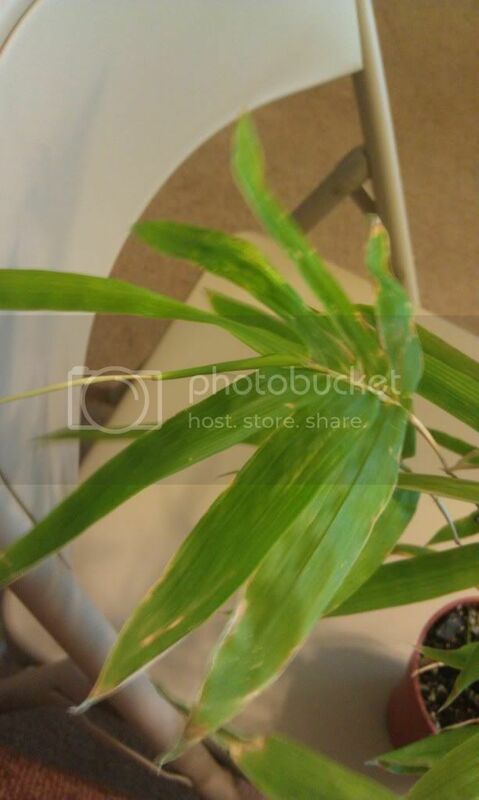 (I posted a picture of one below) Also I noticed some of the culms on the bottom are beginning to grow as well and I have attached a picture of this that shows the difference. It looks like it may not die after all! Day 4: A possible new Leaf? Yes, your last pic is of a new leaf emerging. 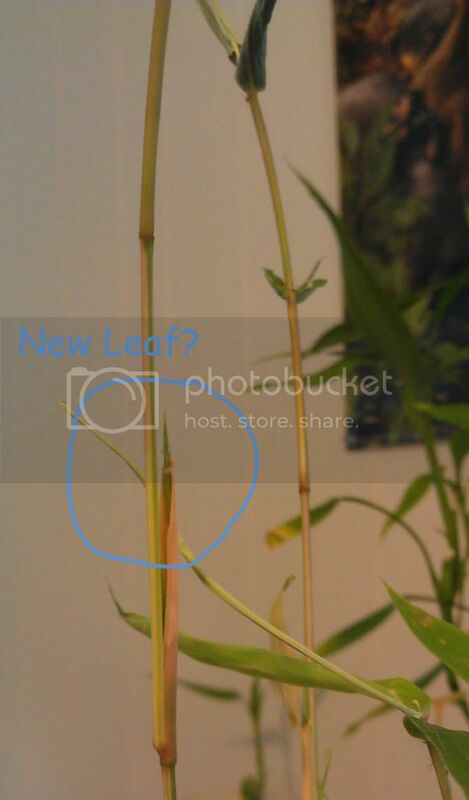 So, after the first few days of devastation my bamboo is beginning to take off, with new growth everywhere, the culms are spouting up, and new leaves are appearing everywhere, however that is where a small issue lies, a lot of the new leaves are developing on the bases of the old, and possibly dead leaves, with bright green new growth at the base, and old faded green (and dry / possibly dead) part at the end. My question is should I cut this part away? It looks like the leaves want to open up, but are unable to because the other half is shut tight and potentially never going to open, I'll attach some pictures to illustrate what I mean. CFL Bulb Broke in Mail - Any Cause for Health Concerns?